Spurred by the United Nation's International Decade for Disabled Persons and medical anthropology's coming of age, anthropologists have recently begun to explore the effects of culture on the lives of the mentally and physically impaired. 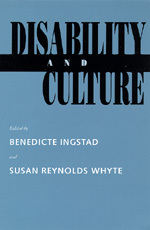 This major collection of essays both reframes disability in terms of social processes and offers for the first time a global, multicultural perspective on the subject. Using research undertaken in a wide variety of settings—from a longhouse in central Borneo to a community of Turkish immigrants in Stockholm—contributors explore the significance of mental, sensory, and motor impairments in light of fundamental, culturally determined assumptions about humanity and personhood. Benedicte Ingstad is Professor of Medical Anthropology, University of Oslo. Susan Reynolds Whyte is Associate Professor, Institute of Anthropology, University of Copenhagen.